Current region: UK. Not all MP3's listed may be the correct versions. If no widget is shown, you may need to update Flash or your browser. Released 9 June 2003 as a double DVD set, and reached no 1 and at least 4 times Platinum status. Length 111 minutes (disc 1) and 134 minutes (disc 2). Recorded at Wembley Stadium, London, on 12 July 1986. 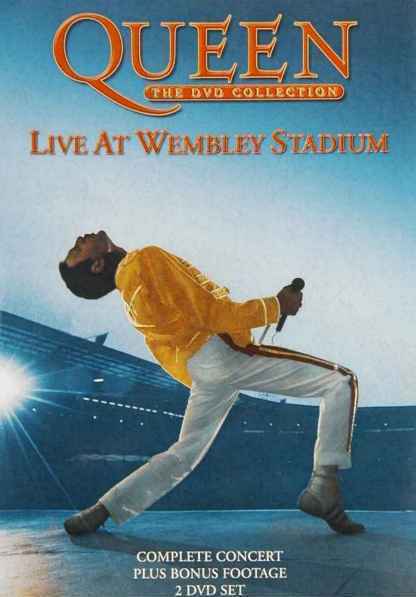 This DVD is an expanded reissue of the 'Live At Wembley' video, and was also released as a double album titled 'Live At Wembley 1986', reissued as 'Live At Wembley Stadium', while this DVD itself was reissued in 2011 also as 'Live At Wembley Stadium'. All of the lyrics to the main concert are found on the original album page. As the menus load on both discs, there is an animation of the Queen Crest, with an excerpt of 'We Will Rock You'. It then features an excerpt of 'A Kind Of Magic' on the menu itself, which features footage shot from the middle of the stadium, with clips from the concert at the top of the screen. Disc 1 features the full concert, the video footage seems identical to the original VHS version, and the audio content is virtually identical to the album. The DVD loses 7 seconds of audience noise between 'Crazy Little Thing Called Love' and 'Radio Ga Ga', but adds about 7 seconds of additional audience noise between 'Radio Ga Ga' and 'We Will Rock You', aswell as additional audience noise between 'Now I'm Here' and 'Love Of My Life' (on the album, it fades out and back in to accommodate the break between discs). The original video began with an edit of 'Brighton Rock', featured time lapse photography of the stadium being prepared, and also an animation sequence. The DVD loses 'Brighton Rock' (replacing it with the beginning of 'One Vision'), and also the animation. However, the time lapse photography is still present and it also features some additional footage. The first DVD menu allows you to play the entire concert, select a song, or change audio. On the song selection screen, if you select a track, it plays a 25 second preview of it; if you select it again, the complete version is played. The audio is available in stereo or surround sound, for which the vocals are more prominent through the front speakers than the rear, but there do not seem to be any other changes. The audio selection screen plays an exceprt of 'I Want To Break Free'. a silent menu with a photograph of the audience, allowing you to select subtitles in French, German, Spanish or Italian. this is footage from the Friday show on 11 July, which was filmed to rehearse the camera angles and directions. The entire show was released as part of the 2011 reissue. this footage is of the band rehearsing a number of songs on a set in London, filmed with a single camera. Many of the songs are edited. This section allows four songs to be viewed with various camera angles, each one following a different member of the band. The first screen is a menu to select a band member, which plays an excerpt of 'Friends Will Be Friends'. The second screen shows a large photo of whichever band member you selected, playing a different excerpt for each, and allows you to select which song to play, or play all. The four menu excerpts played are 'One Vision' for Brian, 'Under Pressure' for Freddie, 'Now I'm Here' for John and 'We Are The Champions' for Roger. The DVD was reissued in 2011, retaining the full concert and rehearsal footage, losing the photo gallery and multi-angle feature, replacing the documentary and interviews, and including the full version of the Friday Night concert. Full details can be found on the 'Live At Wembley Stadium' 2011 Reissue page. Recorded in London before the start of the tour, presumably in May or June 1986. Length 1:28. This track is available on the 2003 DVD and 2011 reissue DVD. Details of the original version can be found on the 'A Day At The Races' album page. Recorded in London before the start of the tour, presumably in May or June 1986. Length 1:21. This track segues into 'Tear It Up'. It is available on the 2003 DVD and 2011 reissue DVD. Details of the original version can be found on the 'Queen II' album page. Recorded in London before the start of the tour, presumably in May or June 1986. Length 2:16. This track segues from 'Seven Seas Of Rhye'. It is available on the 2003 DVD and 2011 reissue DVD. Details of the original version can be found on the 'The Works' album page. Recorded in London before the start of the tour, presumably in May or June 1986. Length 1:52. This excerpt features only the ending of the song. It is available on the 2003 DVD and 2011 reissue DVD. Details of the original version can be found on the 'A Kind Of Magic' album page. Recorded in London before the start of the tour, presumably in May or June 1986. Length 1:53. This track includes a break while the band discuss various elements of the show. The two parts of 'Now I'm Here' are 0:08 and 1:23, and include only the very start and end of the track. Details of the original version can be found on the 'Sheer Heart Attack' album page. Recorded in London before the start of the tour, presumably in May or June 1986. Length 0:53. Recorded in London before the start of the tour, presumably in May or June 1986. Length 4:58. This track features a piano introduction of approximately 16 seconds, which is not included in the above time. Details of the original version can be found on the 'A Night At The Opera' album page. Scaramouche, Scaramouche will you do the fandango? Disc 2, Title 3. Length 29 minutes. Directed by Rudi Dolezal and Hannes Rossacher. Excerpt of 'The Ring', interview with Harvey Goldsmith, and excerpt of 'Let Me Live' with footage of audiences arriving. Interview with Jim Callaghan (security manager), and excerpt of 'Bring Back That Leroy Brown' with further audience footage and the stadium being prepared. Interview with Freddie and excerpt of 'Fat Bottomed Girls'.